Unplugged and Off-the-Grid ~ A Change of Scenery (Part 6) – Travel. Garden. Eat. After two nights of camping on the island, it was time to pack up and begin making our way back to our original entry point. 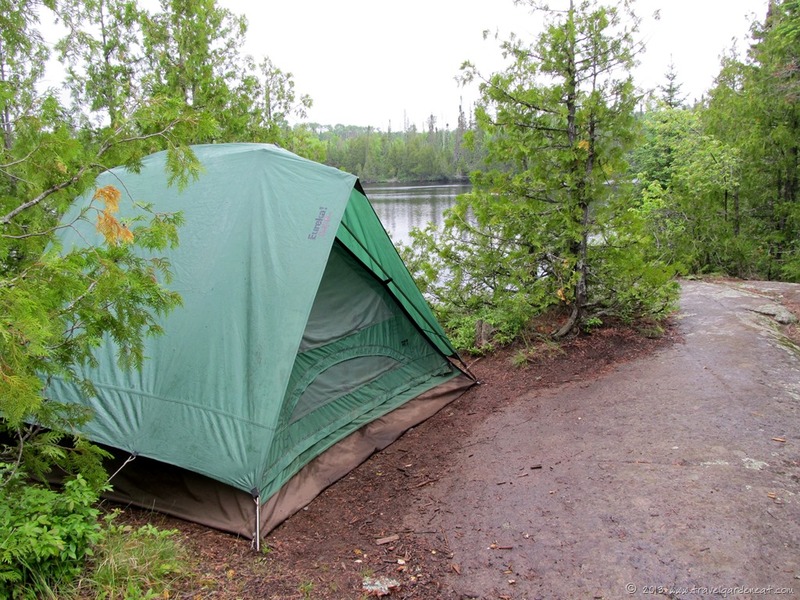 We had hoped to spend our last night at a campsite on Cross Bay Lake, but someone else had beat us to it. 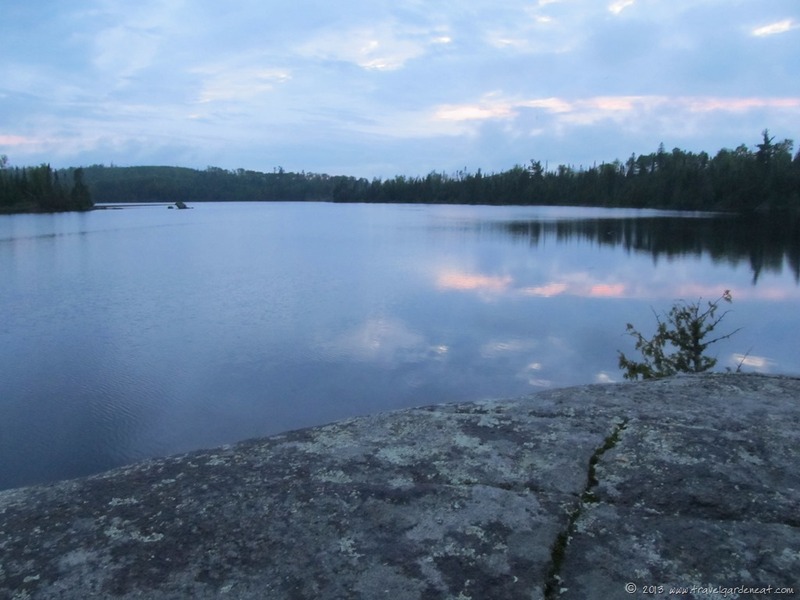 Paddling on, we had our pick of sites on Ham Lake — technically outside of the Boundary Waters area, although virtually indistinguishable in beauty from many of the lakes on the other side of that boundary line. Following the recommendation of our outfitter, we settled into a campsite on a rocky peninsula. We quickly learned that wading in the shallow surrounding waters was not without its minor hazards. My son insisted I take a photo of this lovely leech — the leeches attached themselves almost the moment your feet hit the water, and water shoes offered little protection. We kept the salt shaker handy for the rest of our stay at this site! A healthy sprinkling of salt on the leech prompted it to curl up and loosen its hold. My husband quickly called “dibs” on the dejected leech carcass as it fell to the ground (with no one putting in a competing bid), as he put it to good use as fish bait. Thankfully, not all camp visitors were so dreadful. 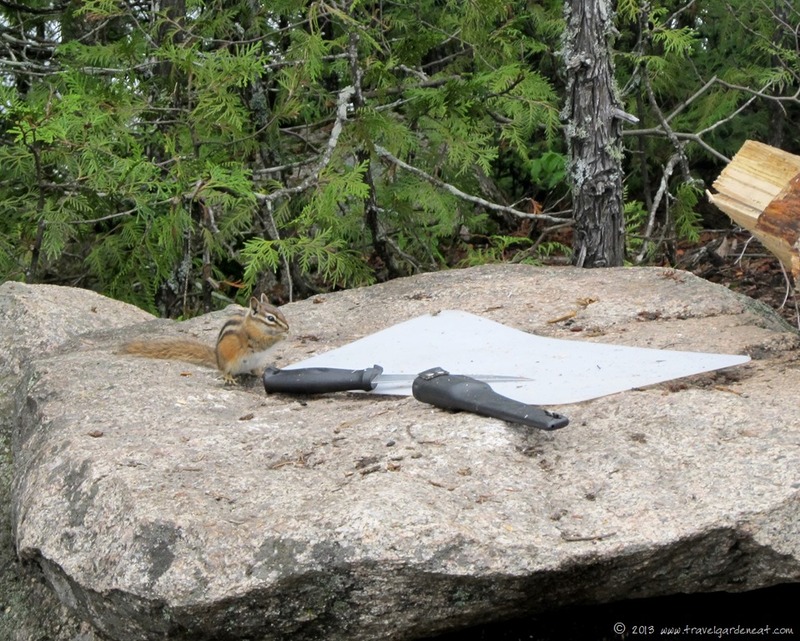 While we did not intentionally feed the chipmunk pair that quickly made their presence known, they were always lurking and quick to take advantage of any untended crumb. 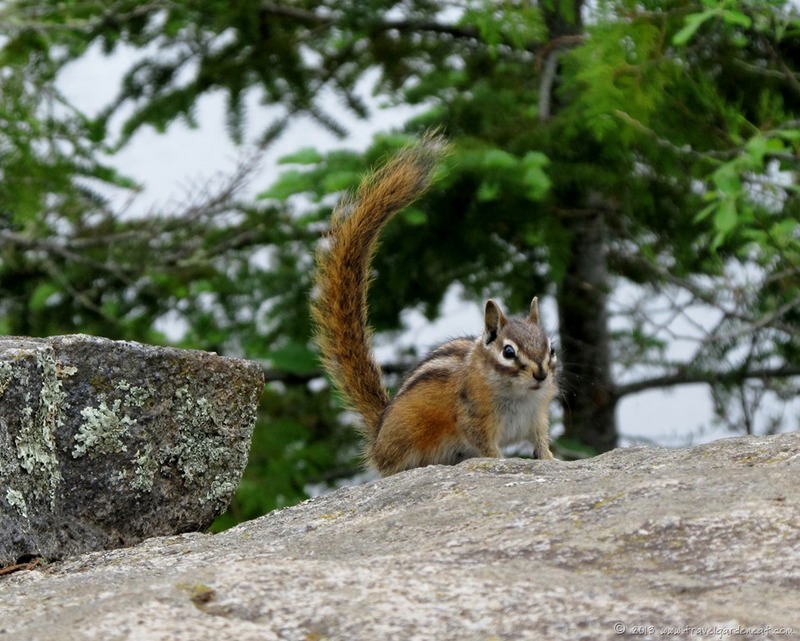 Frankly, these little striped culprits are often more a threat to your food pack than the bears! The last night remained gray and cool, but the rain held off to provide some quiet reading and reflection time. We almost had a hint of a sunset through the clouds. A solitary duck swam across the lake, as if set to a metronome . . . quack . . . quack . . . quack . . . and our last night of being unplugged and off-the-grid drew to a close. I never saw a real leech in action ! Did it hurt ? And salt…who knew ! 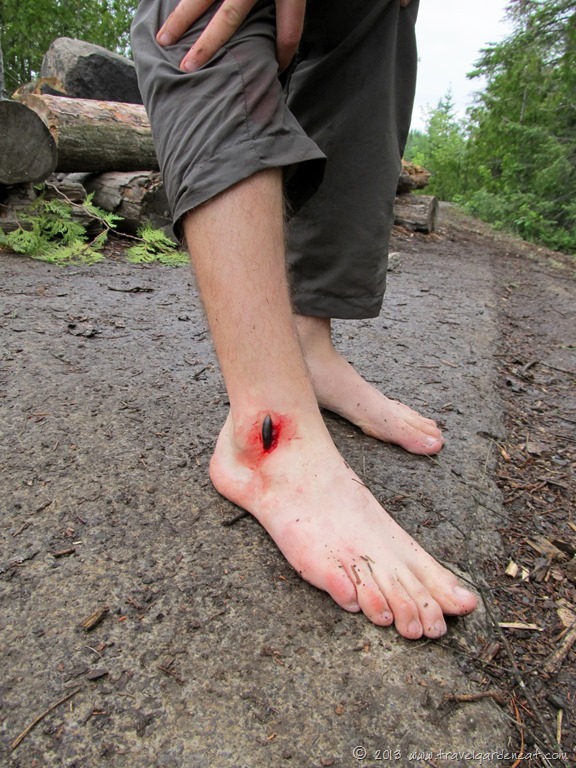 It was caught right away, but even so bled a lot after removal, because they have some kind of anti-coagulant agent that comes into play after they attach. My son said it was more of an itchy sensation than pain after it was removed. Gave us a reason to break out the first aid kit and find some anti-bac gel and bandaid! That amazing. Its funny I was traveling recently and was at a train museum and they had an old apothecary display and a big bowl full of fake leeches which were used originaly for medicinal purposes and I was just thinking about it looking at the picture earlier tonight…: ) looks like you had a great trip ! Although a bit of sun would have been nice, this was nonetheless a great way to end your holiday. Having just spent some time off the grid, I think it’s great to unplug for a bit. A great series…thanks for sharing…but yuck to the leech! 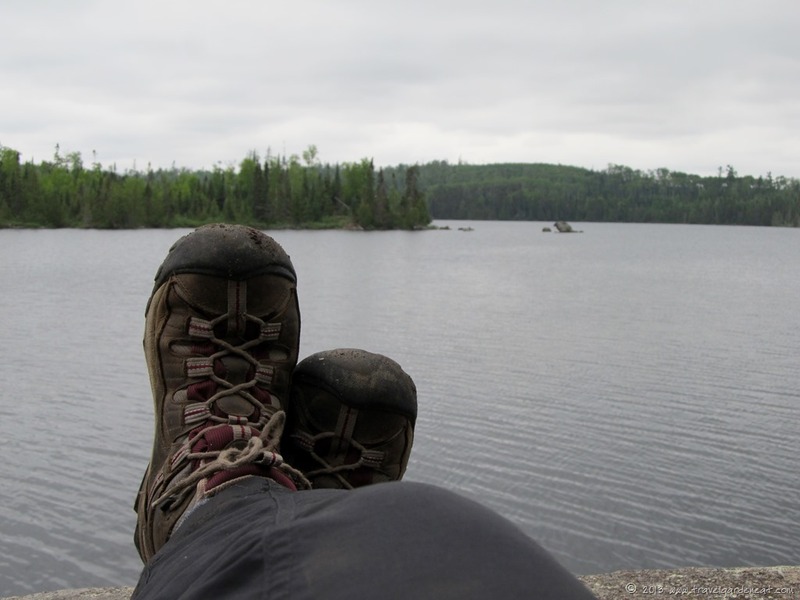 Great photos (except for the leech), and I think I have the same hiking boots — Keens? 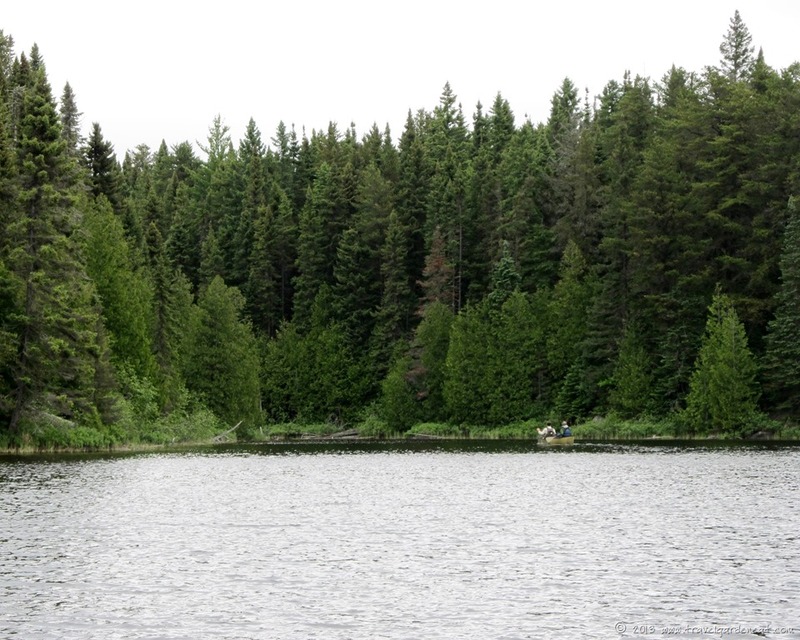 The rest of the scenery and time spent on the water made up for creatures such as the leech! Can not think of a better way to holiday. Your photographs and narrative have been so enjoyable. Thank you for sharing. Now…the leech! You really got a rise out of me! I figured the leech might shake things up a bit! That is so awful about your husband — the occasional leech is bad enough! They are sneaky, nasty little things. Keens rock! I’m not too fond of leeches. I loved that last photo! Breathtaking! Thanks! I love my Keens — most comfortable hiking boots I have ever owned. As for love of leeches . . . not so much. Kat, this sounds like a most lovely vacation in the woods. I could almost smell campfire smoke and wanted to be right there along the edge of that lake. Except for the leech experience. Remember getting those when we lived along a small lake in Lower Michigan while growing up. Very challenging. Thank you for sharing this! Pingback: Unplugged and Off-the-Grid ~ Conclusion: Heading Home | Travel. Garden. Eat. This is a great opportunity (minus the leech, but I suppose that provides a good story to your son). The chipmunk reminds me of a summer afternoon many years ago spent at an acquaintance’s cabin on a lake in the Adirondacks – my son and his son managed to feed a resident chipmunk some sunflower seeds, with the patience of a nothing-else-to-do afternoon spent far away from the normal distractions of their lives. These kinds of places invite that activity – -the activity you always convince yourself you otherwise have no time to do. 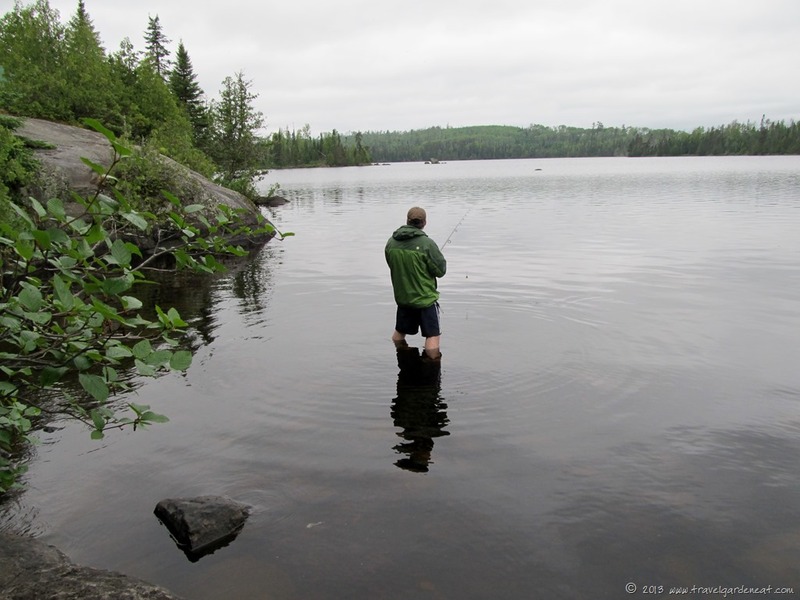 Pingback: Unplugged and Off-the-Grid ~ The Call of the Loons (Part 5) | Travel. Garden. Eat.